Lovebirds and parrotlets look -- and behave -- a lot alike, but a trained eye can easily spot their differences. Both of these types of small parrots are quite personable, thriving on human company. Differences between the two species include size, sexual characteristics and the ability to repeat your words and phrases. Although the basic build of the two birds is the same -- short-tailed and squat -- various species have different colors on their green bodies. In the United States, the most common type of parrotlet kept as a pet is the Pacific green. Males have certain blue patches. The less popular Mexican parrotlet has blue tail feathers, while the female has yellowish tail feathers. The male speckled parrotlet has blue rings around the eye, while the female's are another shade of green. The yellow-faced parrotlet has the telltale yellow face. The peach-faced lovebird does indeed have a peach-colored face, while the less common black-masked lovebird has ... a black mask. Fischer's lovebird, another species sometimes found in the pet market, boasts a red beak and appears in various color mutations. Parrotlets are sexually dimorphic, meaning that males and females look noticeably different. Male parrotlets sport blue markings on their heads, tails and wings. Female parrotlets either don't have these markings or have markings that are hard to make out. It's generally difficult to distinguish male and female lovebirds, especially in the species most often kept as pets. Male lovebirds might be slightly larger than females, but the difference is subtle. Parrotlets are smaller than -- approximately two-thirds the size of -- lovebirds. The various types of lovebirds range between 5 and 6 inches long, while parrotlets range between 3.5 and 5.5 inches. A larger parrotlet weighs considerably less than a smaller lovebird. Mature parrotlets weigh between 18 and 28 grams, with even the heaviest weighing less than an ounce. Lovebirds range between 35 and 55 grams, or 1.5 ounces to 2 ounces. The peach-faced lovebird is the largest of the species commonly kept as a pet, weighing about 2.5 ounces. If you want a talking bird, neither the parrotlet or the lovebird is a great choice. However, you're more likely to have luck teaching a male parrotlet to speak than teaching a female parrotlet or a lovebird of either gender. Male parrotlets might learn to speak a dozen words or more, along with whistling tunes and imitating sounds. Lovebirds might imitate human sounds but seldom learn to actually speak. 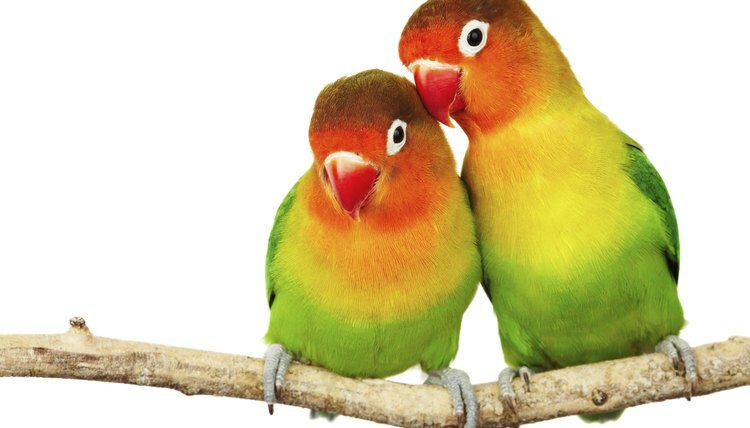 Lovebirds tend to squawk, while parrotlets don't squawk and merely chirp.